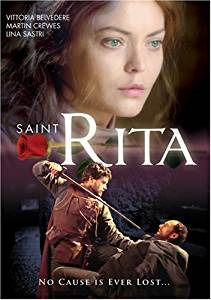 Famous as the patron of hopeless situations, St. Rita of Cascia is immortalized in this wonderful, deeply moving film about this beautiful woman who lived in Italy in the 14th century. Starring Vittoria Belvedere and Martin Crewes, this powerful story combines high drama, great love, deep betrayal, senseless tragedy, profound forgiveness and strong faith as it tells the story of this brave and loyal woman who married her knight, helped him overcome his dark past and convert to faith, happily bore him two childern, and later endures immense pain as she loses everything in her life. She finds peace and new hope through generosity of a nearby convent of sisters, and with their help she develops a deep union with Christ that greatly inspires all who near her. Also includes a special 16 page Collector's booklet.